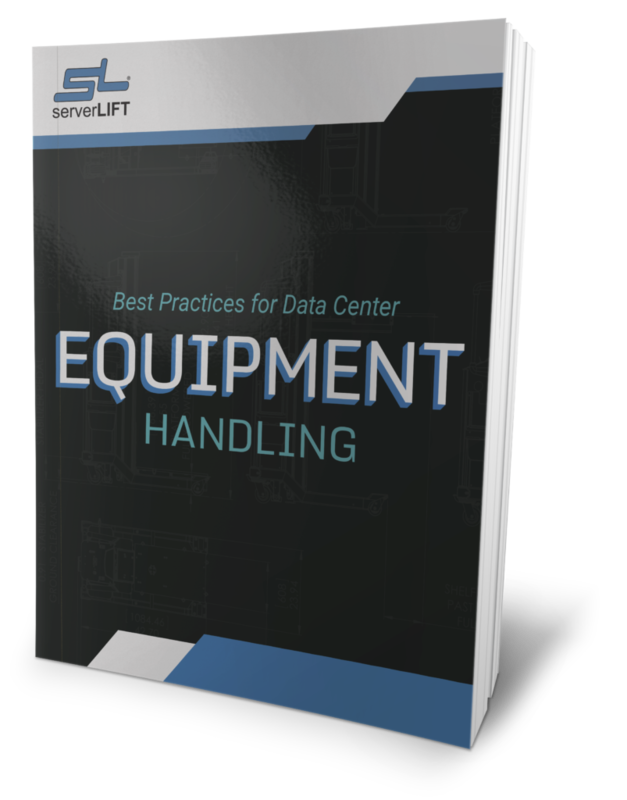 Any server-handling tool considered for use in a data center must, at the most basic level, be able to safely and efficiently carry out the essential functions needed from a data center lift. 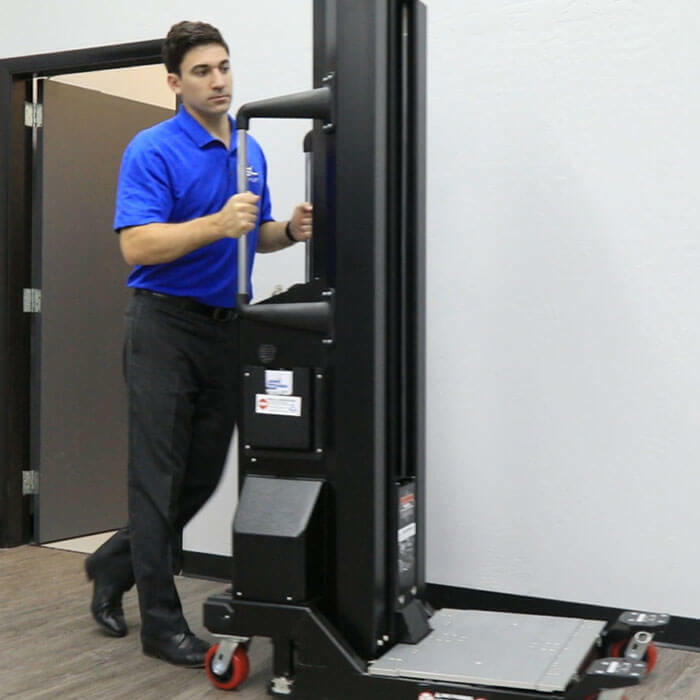 ServerLIFT’s tallest device, the SL-1000X® Super-Duty Lift, measures less than 6.5 feet (197 cm) tall, permitting it to move comfortably through any doorway or elevator. 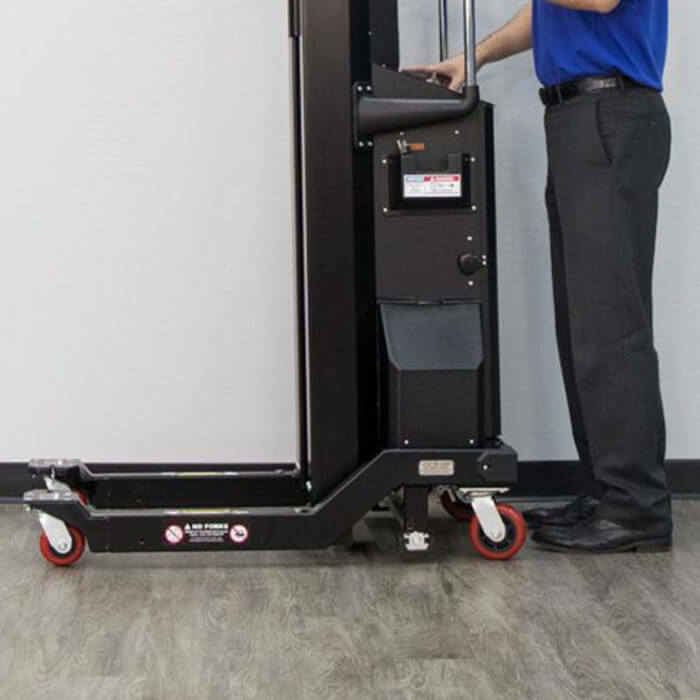 Using a ServerLIFT device, your staff will not lose time or take risks transporting servers with push carts and then transferring them to the data center lift for an install. ServerLIFT purpose-built devices allow operators to safely access both sides of the aisle without having to turn the device around. They were designed for ultimate practicality as they install and remove equipment from racks, without the need to rotate the lift in the aisle. Even better, our lifts can be locked into place using controls both on the brakes and the handles for safe positioning. 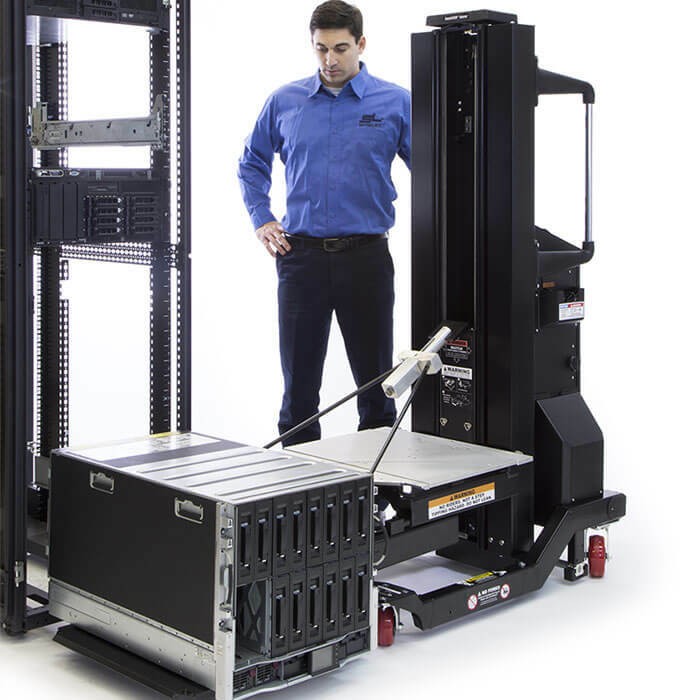 A ServerLIFT machine has nearly a full inch of undercarriage clearance (0.9-inch [2.28 cm]) without compromising on how low it can install servers in a rack. It will not bottom out nor get stuck when traversing common obstacles or standard ADA ramps. It also has large wheels, making it easier to push with greater overall stability. Our data center lifts will not get stuck or tip over in any data center environment when used as instructed. 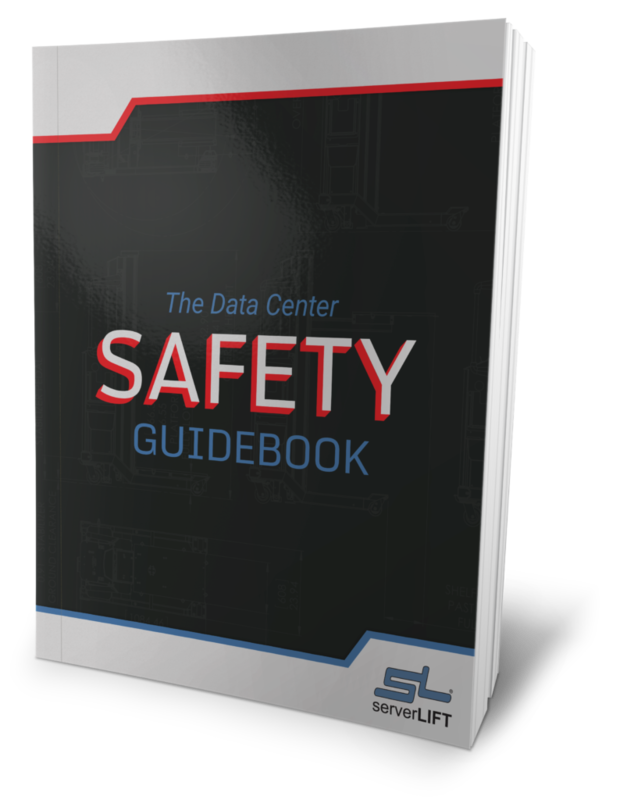 A data center lift must position and support servers precisely and steadily to make it easy for operators to do their work. 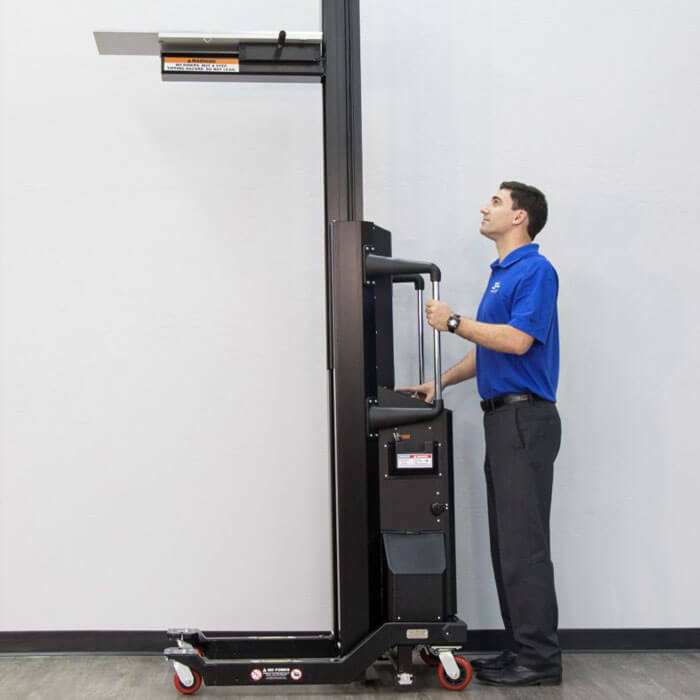 ServerLIFT devices reach up to a minimum of 8.16 feet (98 inches [248.9 cm]), or, with the RL-500™ Platform Riser, to 9.5 feet (114 inches [289.5 cm]). The SL-1000X supports servers up to 8.75 feet high (105 inches [266.7 cm]) and is also compatible with the RL-500 Platform Riser for extended reach when required. 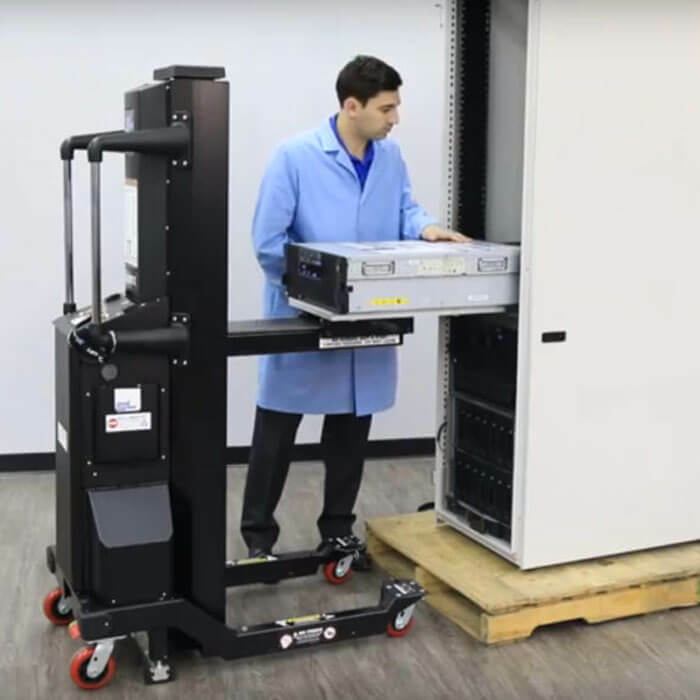 In addition, by attaching a PL-500X® Platform Extension to the ServerLIFT device, equipment can reach the lowermost positions in a rack or cabinet and even all the way down to the floor. All of ServerLIFT’s devices have rigid platforms that will not sag, which can throw off side-to-side alignment and complicate the installation process. In addition, our lift platforms feature SmartTILT™ technology. An operator can adjust the platform angle in precise measure for proper alignment of the server with the rack posts. The shelf can be tilted up or down with a total range of 2 degrees for micro-leveling when an operator is working with heavy loads causing slight deflection. ServerLIFT designed its data center lifts to adjust the forward angle of servers using the RS-500X™ Rail Lift. This into-the-rack angling allows for easing equipment into slotted rails safely without manual effort. 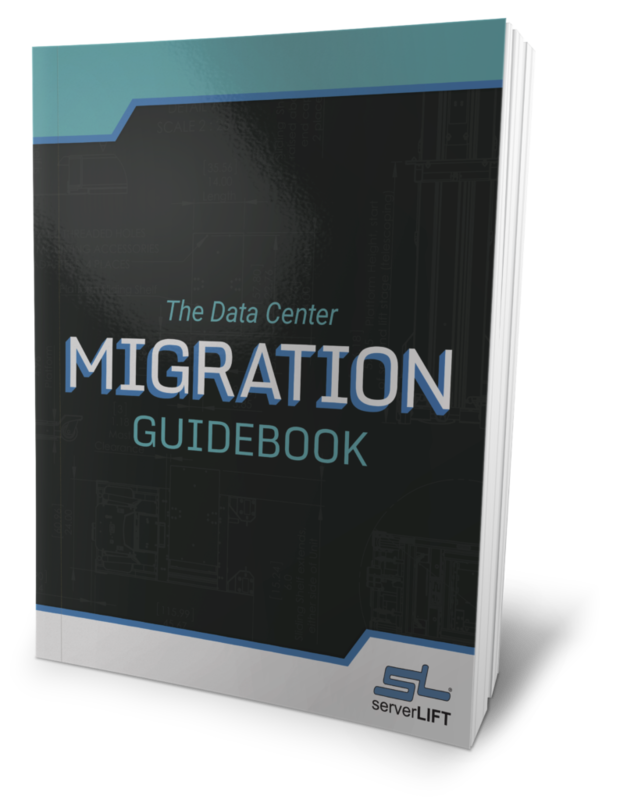 Your IT staff, equipped with ServerLIFT solutions, will never have to struggle to line up the nail-heads of a server with the rail slots by hand ever again. Data center server lifts must effectively and safely assist in the installation and removal of servers to/from a rack. ServerLIFT platforms support servers into the server cabinet with ease. 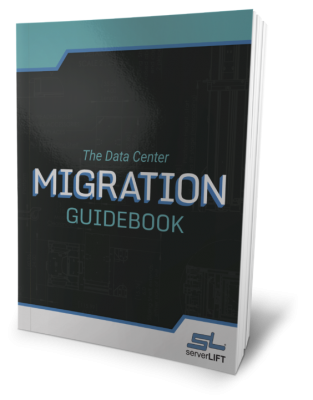 The ServerLIFT SL-1000X®, SL-500X®, and SL-350X® data center lifts feature a Sliding Shelf which extends 6 inches to each side for side-loading capability for a total of 12 inches of travel. 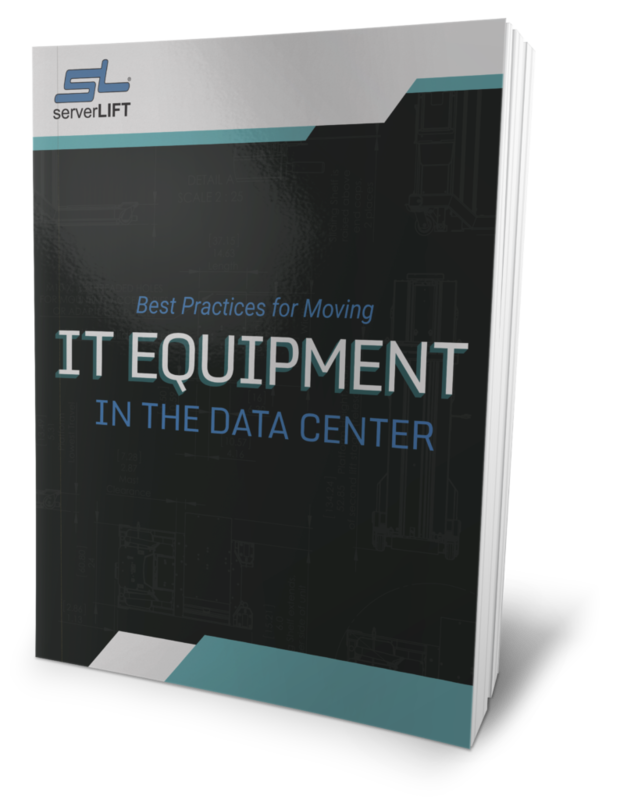 The ServerLIFT SL-500FX™ Front Loading Lift is capable of supporting equipment up to 20″ and placing it into any server rack. The WS-1X™ Extended Shelf is a valuable attachment, nearly doubling the forward reach of the SL-500FX platform. The ServerLIFT winch-pulley-cable system lies outside of the platform lift area, and it is enclosed, protecting hands from potential pinch points. Its frame does not surround the platform, so it does not interfere with reaching the server from either side, back, or front. 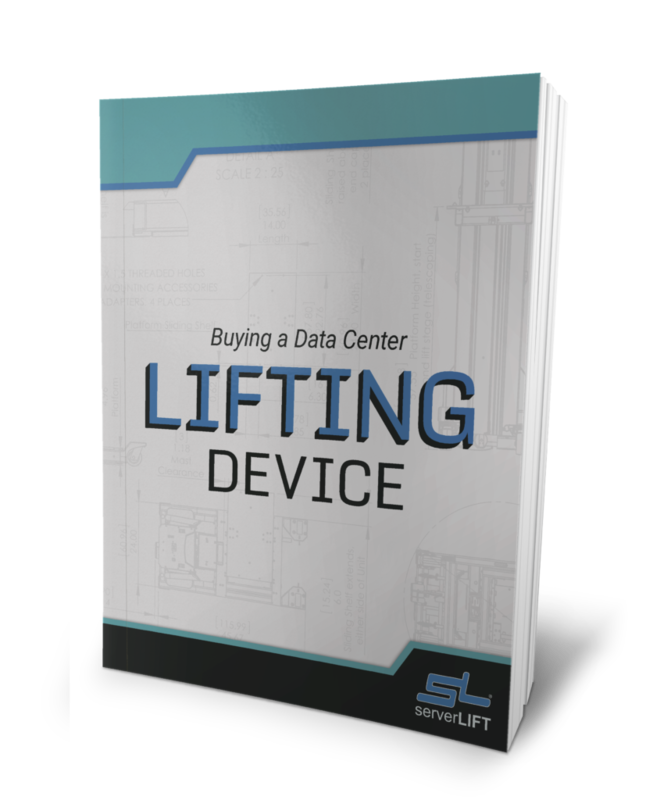 ServerLIFT data center lifting devices can support any server within device capacity. 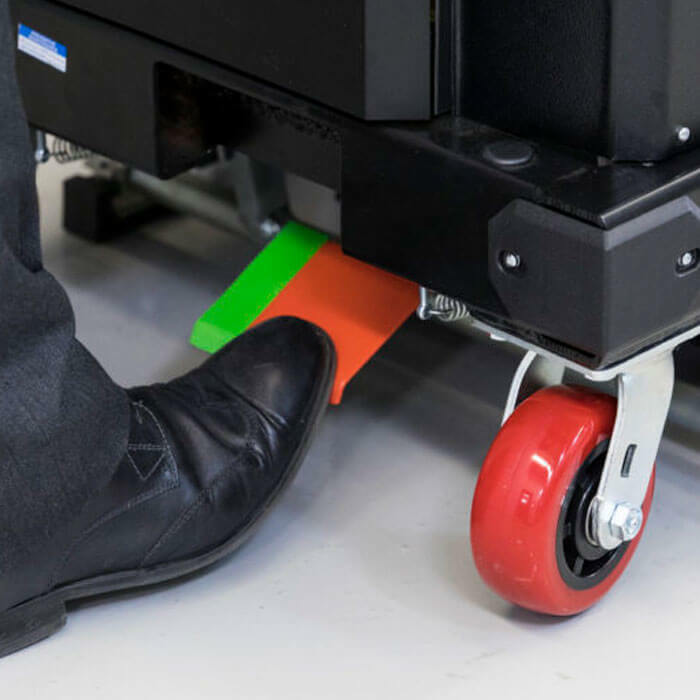 They are designed for incredibly stable, yet freestanding installation and removal, and will not tip over while traversing uneven data center floors. Our dual-point stabilizer brakes are large and accessible for ease of use and lock down the lift, preventing any movement even when pulling a heavy server on or off the platform during a server move. ServerLIFT equipment stays stable without the need for straps, although we do recommend straps to secure equipment to the lift for use during transport. * Both the 600RS and the RL400 devices only go up to 40U and require additional accessory purchases in order to accommodate racks of standard height of 42U. Racklift states that the 600C is customizable.